As the federal courts intervene to restore early voting, the governor admits that he signed antidemocratic legislation without considering the consequences. Wisconsin Governor Scott Walker has for many years engaged in urgent advocacy for laws that make it harder for voters to cast ballots. As the governor of a state that frequently backs Republicans in off-year elections, but that has not backed a Republican for president since 1984, Walker has emerged as a national leader in the fight for rules and restrictions on practices and procedures that are designed to make voting easy. That has put the governor at odds with Wisconsin’s historic commitment to high-turnout elections. But he has not pushed forward, signing stacks of bills that erect barriers to participation in the political process. “There have been so many anti-voting laws in this state, it’s hard to keep track,” Analiese Eicher, the program director for the group One Wisconsin Now, told The Nation earlier this year. Eicher makes an important point. And her group has done much to quantify the battering that voting rights has taken under this particular governor. But Walker has always denied the charge. He has fretted urgently, in speeches to fellow Republicans, in press conferences, even in debates, about “illegal” voting. And he has made the fight to constrain and constrict voting central to his governorship. 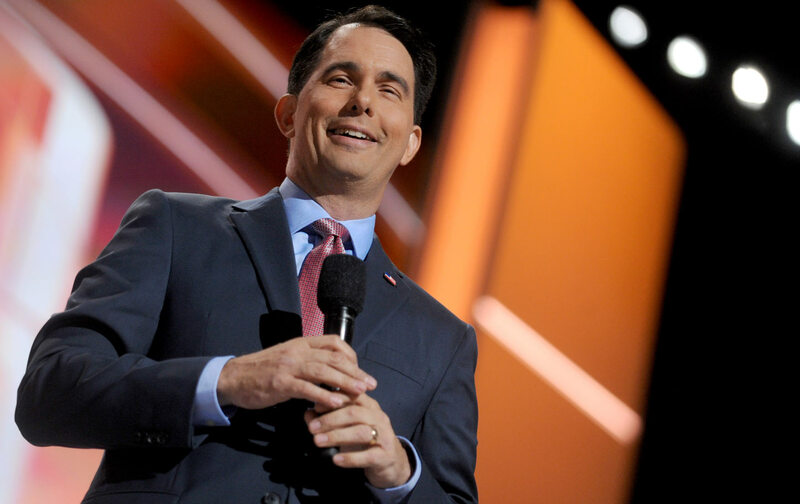 Walker is often accused of shirking his responsibilities as Wisconsin’s chief executive. When the governor is not attending one of Fox host Sean Hannity’s Trump talks (as he did the other day in Milwaukee), Walker’s jetting off to some fundraising event to pay off debts from his failed presidential run or visiting with folks from New Hampshire and Iowa to lay the groundwork for a another presidential bid in 2020. But there is one area where the governor has been very serious, and very focused. When it comes to enacting unconstitutional schemes to make it harder to vote, Walker has always stayed on top of things. In addition to approving some of the harshest voter-ID legislation in the nation, the governor signed a 2013 measure that limited hours for in-person absentee voting and eliminated weekend voting. Peterson also overturned a number of other Walker-approved measures that made voting harder, including laws that extended Wisconsin’s residency requirement for voters from 10 days to 28 days and blocked the distribution of absentee ballots by e-mail and fax. Bizarrely, Walker’s reaction to the ruling, and to subsequent decisions sustaining it, has not displayed any sense of urgency. In fact, Walker’s response has suggested that he was casually signing voter-suppression measures into law without even considering whether they were minimally necessary or minimally constitutional. As it happens, Peterson also ordered a number of changes with regard to Walker’s restrictive voter-ID schemes. But the governor’s suggestion that limits on early voting weren’t priorities—and his refusal to answer recent inquiries about whether he even thinks the limits are wise—is outrageous. The legislation limiting early voting had a serious impact on elections in Wisconsin. It made it harder for voters to cast ballots. It put Wisconsin at odds with the Constitution, and with the historic values of a state that has long believed that a genuine commitment to democracy requires that voting should be easy for all citizens—including those whose work and family schedules make it difficult to cast ballots on regularly scheduled election days. For Walker now to suggest that the limits he signed into law were not a priority, for Walker to decline to say whether he even thinks such limits are necessary, represents a shocking admission of the irresponsible approach this governor has taken to fundamental questions of how voting rights are protected and democracy is made functional. Scott Walker has admitted that he signs sweeping legislation without considering the consequences. Walker is not alone in signing legislation that is designed to make it harder to vote. Other Republican governors have done the same, and Republicans in Congress and in the presidential race have advocated for voting restrictions. Of late, Donald Trump has been peddling his own vile variation on Walker’s “voting illegally” talk. What distinguishes Scott Walker is that he has essentially acknowledged what the others try to keep secret: that supposedly urgent rules and restrictions are not even “priorities.” This acknowledgement leads to the logical conclusion that all these new restrictions on voting are what critics have suggested: scattershot attempts to put every possible barrier in the way of voters who might not cast their ballots for Republicans like Scott Walker and Donald Trump.